Yoga Toka is a holistic, peaceful, and awakening yoga & healing arts studio offering a wide variety of classes, workshops, and trainings to bring you the latest on healing techniques and other information that will assist you as you move forward on your path of discovery! 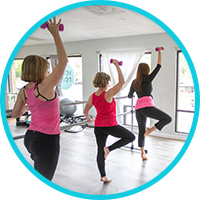 Yoga Toka is more than just a bright, beautiful space in which to practice yoga and fitness. We are a community of caring people who connect positively with each other. We offer an inclusive, judgment-free environment where you will benefit from unique "extras" like essential oils and hot stone therapy in addition to having your goals heard and supported. 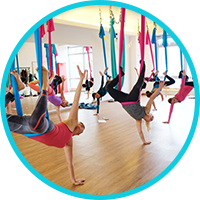 Yoga Toka proudly features classes with some of the most talented local yoga & fitness instructors in the Northern Virginia area. 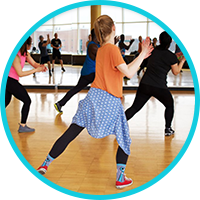 Learn more about each one of them by visiting our Instructors page. After several weeks of working to open Yoga Toka under new management, this Yoga Studio extraordinaire is filled with state of the art classes, well-informed teachers, and beautiful energy that makes a person feel they have finally come home to the right place. The atmosphere created by Yoga Toka staff is unique and designed to create the perfect experience for all ages. Enjoy Yoga Toka’s other items, too, such as crystals, body butter, yoga clothing, yoga mats, pillows, books, jewelry, and much, much more! As a participant in several classes at the Yoga Toka studio, I have been overwhelmingly pleased and impacted by the knowledge, grace, and compassion offered by staff. This studio truly leaves you feeling refreshed and supported. I love this place! Anastasia is an amazing hypnotherapist. She makes you feel very comfortable before the session starts, she explains what to expect. The experience of hypnotherapy itself was very interesting and one I highly recommend. We store A LOT in our subconscious and it was really insightful to get a short peak into my memories and experiences. I have felt a big shift in energy regarding some habits and fears I was hoping to move past. I was very pleased with my session. Thank you, Anastasia! This weekend I met with the owner of this new studio that opened at the bottom of Quaker Lane. She’s wonderful and is offering afterschool yoga for kids with pick up from school in a 5-mile radius. She also has scheduled yoga classes for adults and kids throughout the week. I’m excited for the kids’ program though and plan to send my son once or twice a week. I’ve really enjoyed the sound healing with the crystal bowls. I feel rejuvenated and emotionally positive afterward. Every cell in my body vibrates and there’s nothing quite like it! I highly recommend experiencing this unique healing sensation. I truly had one of the life-changing and transforming experiences I have ever had in my life after visiting Yoga Toka. I really enjoyed the entire experience and have already recommended it to just about everyone I have spoken to. I am so grateful for a peaceful and relaxing place that I found at your studio. ©2019 Yoga Toka. Do not copy. All rights reserved.